Update: Yet another report is chiming in with iRadio details, centering on a change to Apple's iAd network that will support the music service. Bloomberg reported Apple is narrowing mobile ads down to major brands that will run campaigns through its streaming music service (a la Pandora) and not via App Store marketing messages. Apple's tune service will be free and ad-supported, people familiar with the matter told Bloomberg, and while it will be different from iTunes, the two will be closely integrated. One feature will reportedly be the ability to download a song played on iRadio. Users will be able to build stations around a song or artist, much like Pandora, when the service is released later this year. It will be publicly available around the same time as iOS 7, a source said. Apple's answer to Spotify and Pandora looks to have taken a big step closer to reality, with growing rumours that a deal with Warner has been done ahead of a big reveal at WWDC. Locally stored music is being squeezed by streaming services like Spotify, with subscriptions allowing access to huge music libraries and cool things like discovery based on your favourites and tracking what your friends are listening to. 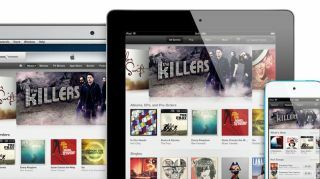 Apple, whose iTunes software has been dominant because of the dominance of the iPod and the rise of the iPhone is aware of this evolution and has been planning its own streaming service often dubbed iRadio. The negotiations with the music companies appears not to have been straighforward, but the sealing of a deal with Warner, following on from Universal Music Group gives it two of the biggest companies with music rights. There are major deals to be done - not least with Sony Music Entertainment, which obviously brings a new frisson of rivalry. But Apple is expected to join the streaming music party soon, albeit late, with what is widely expected to be a free but ad-funded service.